What happens during a typical energy audit? 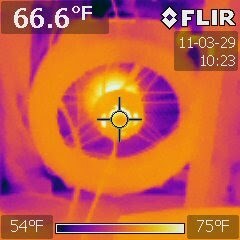 [Left, a thermal image of the fan in a blower door]. After arriving onsite, the auditor talks with the client about the home, and the client’s experience in the home. The auditor and client tour the home, and the client is able to point out any areas of concern. The auditor measures the footprint and interior spaces of the home, and draws a physical map of the home. The auditor takes photos and notes of any energy-related features in the home. If there are appliances that burn fuel, the auditor conducts a Combustion Safety Test, including checking for combustible gas leaks, carbon monoxide leaks, draft pressure, vent clearance, and appliance function. During this test the auditor may be required to drill a quarter inch hole in the exhaust pipe of one or more combustion appliances. If such a hole is drilled, the auditor seals each hole with a stainless steel screw and high temperature caulk. The auditor then sets up the blower door, which is a metal frame covered with a nylon membrane with a large fan in the middle. The fan pulls air out of the home, creating a vacuum to a standardized pressure, which allows the auditor to conduct a blower door test. The testing can also be done with the fan turned the other way, to pressurize the home. The blower door test can take up to an hour, and involves the auditor pressure testing the ductwork, the floor, and the attic, and using a thermal camera to find air leaks. After disassembling the blower door, the auditor inspects the attic, crawl, and exterior walls for insulation levels, appropriate venting, air sealing opportunities, and a variety of other factors. The auditor briefly reviews his findings with the client (his report will contain the details), makes sure everything in the house is back to normal, and then leaves the site. The audit takes 4-6 hours, depending on the size and complexity of the home.